Yi Zhou* joined the first violin section of Vancouver Symphony in 2009. She started her violin studies at the age of 6 in Mainland China. After finishing her Bachelor’s Degree at the Shanghai Conservatory of Music, Yi received a full scholarship to continue her violin studies with the renowned German violin professor Alice Schoenfeld at the University of Southern California in Los Angeles. At the same time she was completing her Master’s degree at USC, she was also very involved in the musical scene in Los Angeles and Southern California. Yi Zhou regularly performed with the Los Angeles Opera, the San Diego Symphony, the Pacific Symphony, and the Long Beach Symphony. She was twice invited to the prestigious Schleswig-Holstein Music Festival in Germany. Concert tours have taken her to Germany, Holland, Finland, Denmark, Latvia, and Estonia. 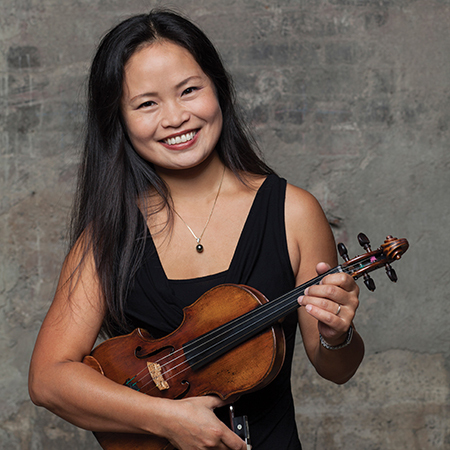 After Yi moved to Vancouver four years ago, she very quickly became one of the most versatile violinists in the Vancouver classical music circle, besides Vancouver Symphony Orchestra, Yi frequently plays with Vancouver Opera Orchestra and the formal CBC Orchestra. She is also actively involved in New Music groups like Turning Point Ensemble, Vancouver intercultural Orchestral, and pop recording projects for Michael Buble. Josh Groban and “The tragically hip”. As a teacher, I prepare students for RCM exams and music festivals, or just simply for the love of music and violin. I believe in building a firm technical foundation by practicing scales and traditional etudes, and at the same time I try to inspire students to discover the wonderful and sensitive world that music can bring to our lives. Playing the violin requires tremendous discipline and persistency; it is a lifetime process. But within this very long and sometimes strenuous process, we learn how to take a challenge and work hard and succeed. Music creates a magical world that is beyond our ordinary daily life, and as a violin teacher, it is my greatest pleasure to be able to introduce this world to my students, to find a piece of music which can inspire them to learn and grow, and ultimately to be expressive, creative, and balanced in life.